The gemstone for birthday’s in March is the Aquamarine. 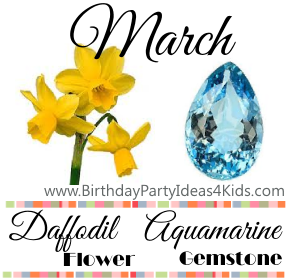 The flower for March birthday’s is the Daffodil (or Jonquil). What are you doing this month for the March birthday’s in your house? Birthday Party Ideas 4 Kids has all the ideas you need to plan the perfect birthday party! We have over 170 fun birthday party themes to choose from … all with party games, activities, decoration ideas, favors, party food and more that relate to that theme. And all the ideas are all on one page which makes it easy to pick and choose which ideas will work best with your child.